JColorChooser represents a a dialog that you can manipulate and select a color value. 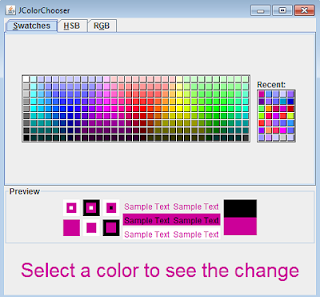 JColorChooser object has its own model that handles color selection. This model can generate the change event. This event occurs when a color is selected. So you need to implement the ChangeListener interface to receive the event. Its useful constructors and methods are shown below. creates a color chooser without initial color. creates a color chooser with the initial color. gets the color from the color chooser. returns the model that handle the color selection. sets the color to the color chooser. -showDialog(Component parent,String title, Color initColor): static Color displays the color-chooser dialog. If you want to display a color chooser in a separate widow, you need to use the showDialog(Component parent, String title,Color initColor) method. It is a static method. So, you no need to create an instance of the JColorChooser. This method returns the color that is selected.